The Bible talks of us being worth more than a sparrow and yet many of these “little ones” are viewed as worthless by society. 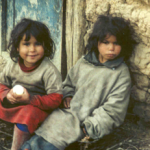 The Gypsy children across Europe have been despised for so long, but Europe’s Children is offering them hope by funding and providing compassionate aid and rescue outreach through our missionaries who work with Gypsies on a daily basis. This includes a soup kitchen in Macedonia and a children’s home and school in Romania. Additionally, we partner with our missionaries in Belgium who have found an open door to meet the needs of trafficked girls. Weekly they walk through the Red Light district giving flowers, gifts, and a smile to the young girls who are often forced to be there against their will. Girls have opened the windows of their hearts to hear more about the gospel message and the hope they can find in Jesus. Time for TEA is our program to raise funds and awareness of this ministry. Click here to learn more about the Time for TEA project.